When I originally started my Cookbook Challenge I said it was because I wanted to avoid always picking recipes from my favourite stand-by books, generally by Nigella and Jamie. 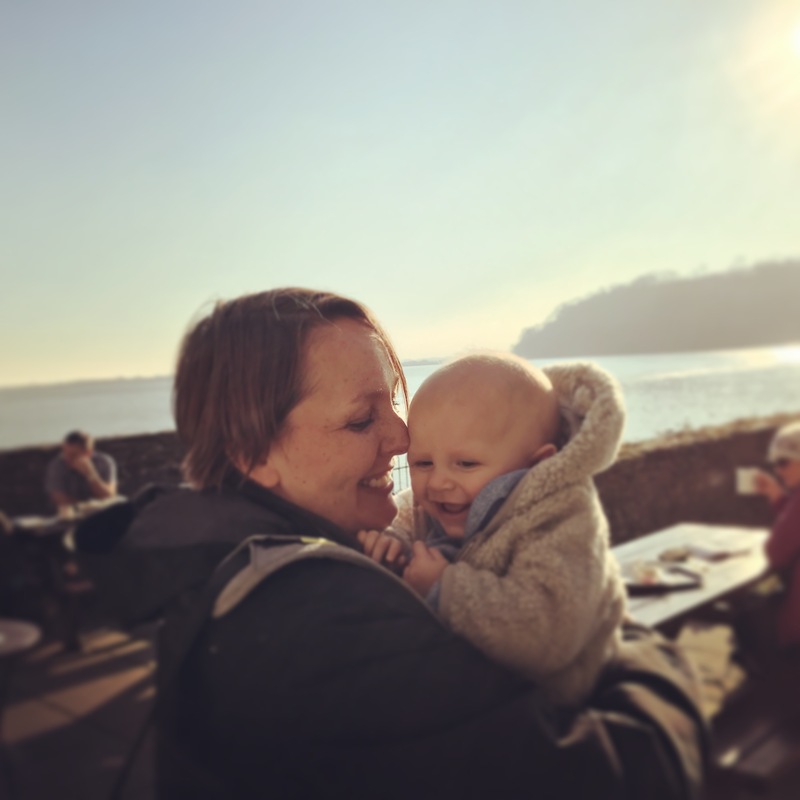 But when Andrew is picking the book each week and happens to have seen a TV show with Jamie Oliver making ‘irresistible pork buns’, there’s not much I can do about it, so my latest challenge is from Jamie’s Comfort Food. Sub-titled ‘Scrumptious happy classics’, Jamie’s most recent offering is full of deliciously decadent recipes, including a duck lasagne and chicken kiev. Had I been left to my own devices, I would have struggled to pick my recipe from all the goodies on offer, but Andrew had already chosen for me with the pork buns. 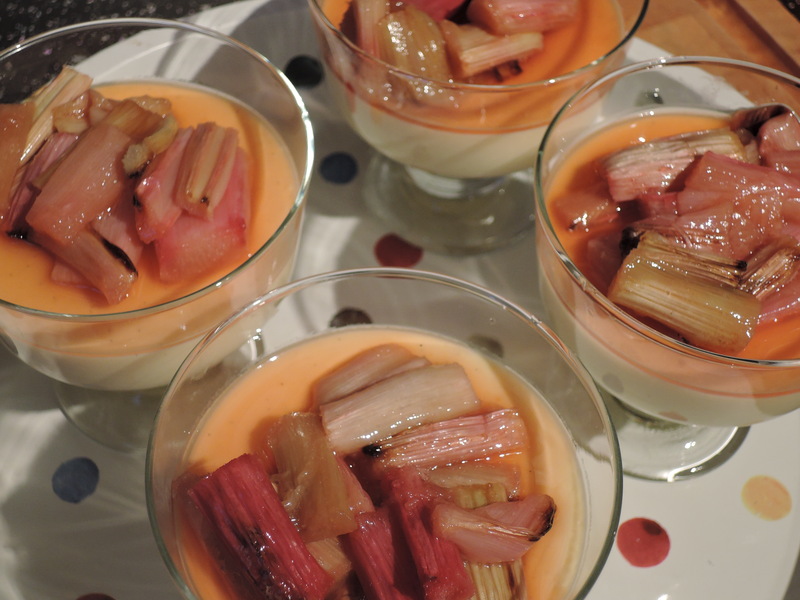 So I rooted around in the book for puddings and eventually decided on the calorific potted custard with rhubarb – a kind of panna cotta flavoured with custard powder which sounded delicious. First thing to note if you are planning to make this yourself: you need to cook the pork the day before you plan to eat the buns. I am not sure this is entirely necessary, but did follow Jamie’s guidance. If nothing else, it makes your pork easier to slice before re-heating for assembly. 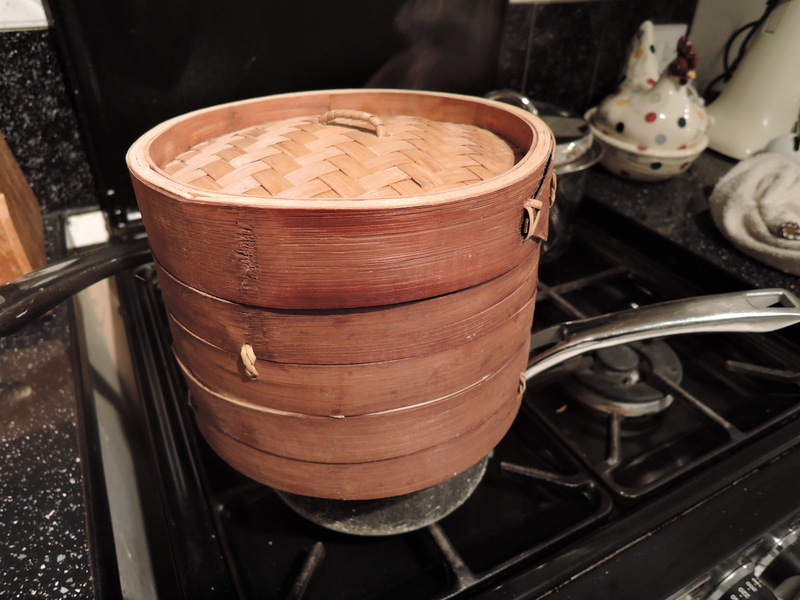 Don’t be alarmed about having to make a dough and steaming the buns if you haven’t done this before. 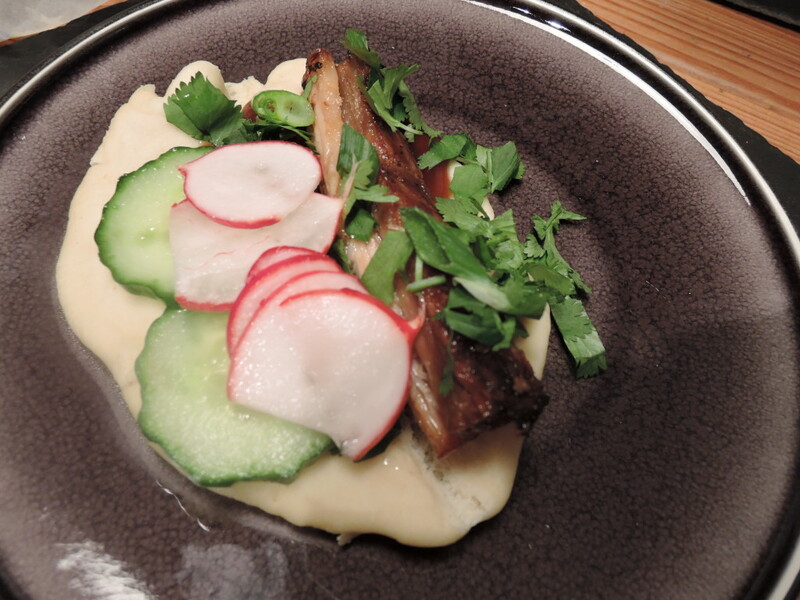 I am notoriously rubbish at dough (it never rises despite me leaving it in my toasty warm proving cupboard – aka the TV cabinet), and have never steamed anything other than fish and vegetables before, but this actually worked very well, so give it a go. Char sui buns are next on my list for this treatment. I don’t know what planet Jamie lives on thinking that this recipe serves four people – the richness of the fatty pork belly and the carb-heavy dough would ensure even the greediest person struggled to eat five buns each (Andrew managed four in one sitting and couldn’t move until the following morning). 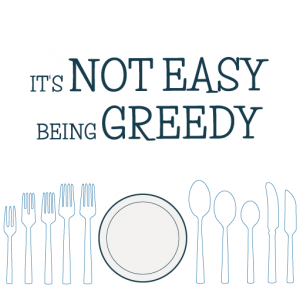 My recommendation would be to have it as part of a meal for 6-8 people rather than have it as a meal in itself … although maybe that’s just me wanting variety as Andrew said he’d be perfectly happy to eat it again as a main meal. 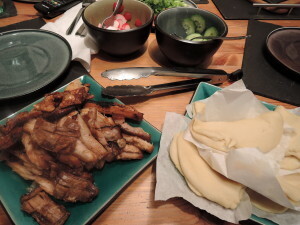 Both the buns and the pork are very good re-heated so don’t worry if you do have leftovers. I would suggest that you re-make the pickles fresh though. I found Jamie’s pickles too bland on first attempt so tweaked his recipe second time around and enjoyed the pickles much more, so my variation is listed below as well. I’d recommend going with what tastes good to you. It’s not hard to lightly pickle veg so go with instinct. Whilst we both loved the pork buns, I was disappointed by the potted custard. I did tweak Jamie’s recipe again as he lists a crystallized ginger crumble in his recipe – as Andrew doesn’t like ginger I didn’t bother. I am not sure it would have added anything to the dish though. In my opinion the custard, although tasty, was too rubbery from the gelatine and wasn’t worth the effort to make. Jamie’s other panna cotta recipe in his first cookbook is my stand-by one, so I was disappointed by this version. My recommendation would be to do away with the gelatine entirely and instead serve the slightly un-set custard in a pretty dish with the rhubarb on top. I kind of did that with the original recipe, but that is because I was feeling too lazy to get out my individual jelly pots and clean them all! Firstly you need to cook the pork the day before you plan to serve your buns. Remove the skin but keep it in the fridge as you’ll cook it the next day for crackling. Rub the pork with the sesame oil and caster sugar and season with salt and pepper. Cover it with a double layer of tinfoil and bake at 140 degrees for five hours. Remove, cool and refrigerate in the same dish overnight. Then on the day you plan to eat the buns, make the dough: combine all the bun ingredients using a freestanding mixer (or your hands if you don’t have one, poor you!) and knead for 10 minutes until smooth. Gently oil the bowl and cover the dough with clingfilm, leaving it to prove for an hour. I left mine proving for several hours and didn’t notice any change in the size of the dough! To make the buns you need to divide the dough into 20 pieces. Roll each piece out to around 10cm x 12cm ovals. 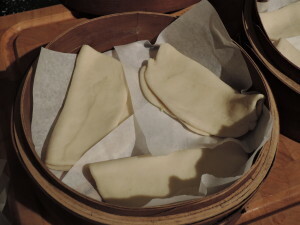 Fold in half width-ways (Jamie recommends using a chopstick to fold the dough over but it’s kind of unnecessary in my view) and lay on a piece of greaseproof paper ready for steaming. I steamed all mine and re-heated them over the next couple of days (in the oven, wrapped in foil) and they were fine, so I’d recommend you do the same. The buns also tasted fine cold – Andrew had them instead of bread to dip into a stew. Before steaming the buns you need to prepare everything, as the final cooking time doesn’t give you long. You need to make the pickles by slicing the cucumber and radish finely (you could also add carrot and red onion to the mix if you fancied it). Put the sliced veg in a bowl and sprinkle with salt, mixing the veg around so it’s coated. Then add sugar and vinegar so all the veggies are coated – taste the veg and add more sugar / vinegar depending on what flavour you like. I’d say for half a bag of radishes and a third of a cucumber I used a couple of teaspoons of sugar, a large pinch of salt and around 10tbsp vinegar. Slice the chilli and spring onions and chop the coriander. I didn’t bother using sesame seeds but if you were going to then gently toast them in a dry frying pan now. Then you need to put the oven on to its highest temperature. 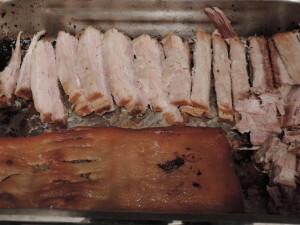 Slice your cold pork to around 1cm thick (or I’d go a bit thinner as 1cm leaves quite big chunks to chew through – bits of the pork get very crispy) and re-heat it in the oven. You could also cook the pork skin to make crackling if you fancied it. 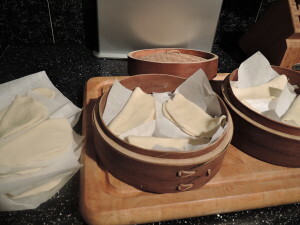 Steam the buns now too – in a single layer in the steamer so you’ll need to do a few steaming sessions – they take around ten minutes each, although it can be hard to tell when they are done. 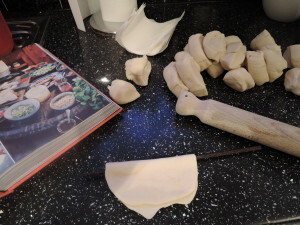 What you want is to see the buns puff up a little and when you pull off a piece of dough it comes away easy and looks to have the texture of bread – you’ll be able to see if it’s still under-cooked as the dough is stringy and elastic if not cooked. This happened to me a few times! So at the table you can allow everyone to assemble their buns as they please. 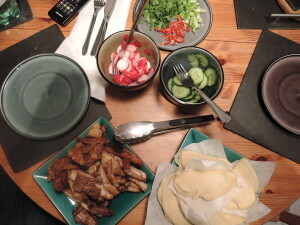 You should have pork, buns, pickles and toppings ready so everyone can help themselves. We made them a bit like crispy duck pancakes: opened up the bun, added some hoisin sauce, then a bit of pork, then spring onion, pickles, chilli (not for me) and coriander. Then stuff into your mouth and enjoy! Soak the gelatine leaves in cold water. First make the custard by pouring 400ml of milk and all of the cream into a pan. Add the vanilla bean paste and simmer gently for 10 minutes. In another bowl, dissolve the custard powder and sugar in the final 100ml of milk. Pour the infused milk onto the custard milk and whisk well. Return everything to the saucepan and simmer again for five minutes, stirring constantly until you have a thick custard. Drain the gelatine sheets and whisk them into the hot custard. Divide into four (or eight if you think you can stretch it) ramekins or glasses and allow to cool. Jamie says you need to leave them overnight but mine had set in a couple of hours. For the rhubarb, cut it into batons and arrange snugly in a single layer in an oven-proof dish. Sprinkle over the sugar and orange juice and bake in the oven at 180 degrees for around 30 minutes until the rhubarb is tender. Set aside to cool. 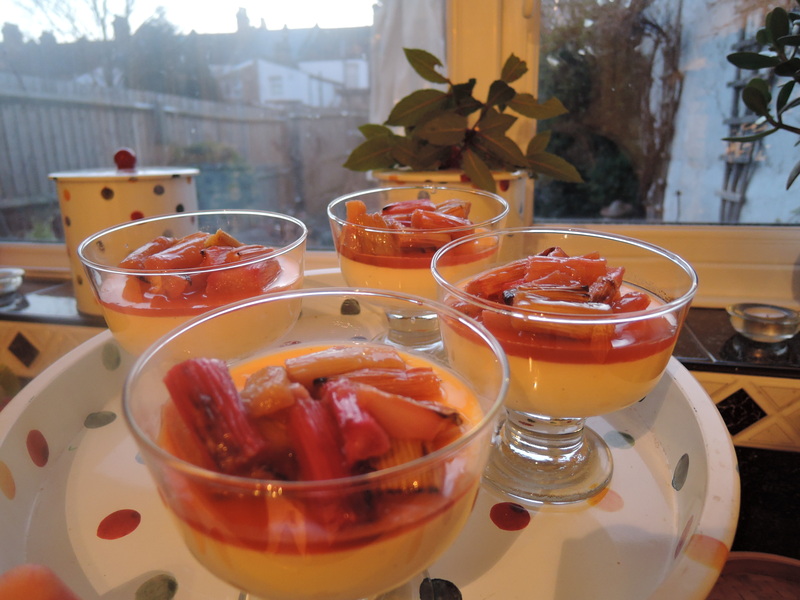 I served the pudding with the rhubarb spooned on top of the custard. You could add something crunchy here if you wanted, but err away from anything sweet as the custard and rhubarb are both on the sweet side. I love Comfort Food, a friend gifted it to me and I love to snuggle up with it – it’s a beautiful if very naughty book. I blogged about Jamie’s other book Save with Jamie and how I did the pork from that, including some very simple steamed buns. Reading your post I can’t help but wonder if you’d prefer those instead? (The post is called The Pluripotent Pig of Plenty, lol.) Big shame about the puds – they sounded wonderful!